Not to be confused with World 1-6, Level 1-6, or Stage 1-6. Area 1-6 is the sixth course of Coaster Hills and the sixth course overall in Mario vs. Donkey Kong: Mini-Land Mayhem!. It introduces Ladders and camera panning. All three Minis begin on the bottom left, with the exit door on the bottom right. In order to reach it, the three Mini Marios must simply travel to it. The front Mini Mario can be activated early in order to obtain many of the collectibles. The M-Token is located at the upper level on the left. 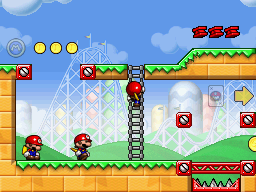 It can be collected by activating the front Mini Mario early, then causing it to reach the upper level and hit the right wall, then come back down and climb the Ladder again. The Mini Mario Card is located on the upper level in an alcove to the right. It can be collected by activating the front Mini Mario early, then causing it to reach the upper level and hit the right wall, then come back down and collect it along the way by drawing a Red Girder bridge. In Plus Mode, the Mini Mario must be guided to the exit door first, followed by the two Mini Toads. In order to earn a trophy, the player must score 13800 points.